RJ45 Crimp Tool from 3C installs CAT5/CAT6/CAT6A modular plug and is specifically designed for RJ45, RJ11 & RJ12 connector types. - Panel crimping action and professional type. - Provides precision operation with key way in 8P modular Holder. - Modular Holders are made of AL-ZN, light weight and durable. - This crimping tool is a great tool for home utility. 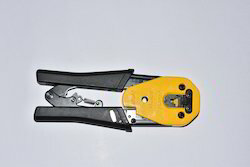 With the backing of our adroit executives, we are indulged in offering RJ 45 Crimping Tool. This ratchet-style crimp tool cuts, strips, and crimps modular plugs on either round or flat cables. The parallel action design maintains accurate alignment of the die with the plug for a precision crimp every time. Note: Color of the product may vary. 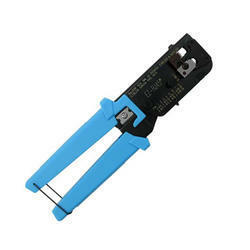 We have seamlessly occupied a special position in the industry by providing a qualitative range of Crimping Tool RJ45.